Stephen F. Austin State University's bachelor's degree program in engineering physics, housed in the newly opened Ed and Gwen Cole STEM Building, has been accredited by the Accreditation Board for Engineering and Technology. 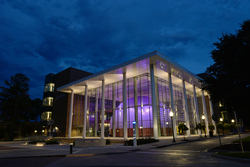 For more information about SFA's College of Sciences and Mathematics, visit www.sfasu.edu/academics. NACOGDOCHES, TEXAS - Stephen F. Austin State University's bachelor's degree program in engineering physics has been accredited by the Engineering Accreditation Commission of the Accreditation Board for Engineering and Technology, the global accreditor of college and university programs in applied and natural science, computing, engineering and engineering technology. "Our engineering physics degree is designed for students seeking innovative careers in high-tech areas where multiple engineering disciplines merge," said Dr. Dan Bruton, director of engineering at SFA. "The engineering physics curriculum has two tracks from which a student can choose: mechanical engineering or electrical engineering. Graduates are prepared to enter diverse areas such as mechanical controls, digital and analog electronics, instrumentation, robotics and manufacturing process control." Developed by technical professionals from ABET's member societies, ABET criteria focus on what students experience and learn. ABET accreditation reviews look at program curricula, faculty, facilities, and institutional support and are conducted by teams of highly skilled professionals from industry, academia and government, with expertise in the ABET disciplines. ABET is a nonprofit, non-governmental organization recognized by the Council for Higher Education Accreditation. It currently accredits approximately 3,800 programs at more than 750 colleges and universities in 31 countries. More information about ABET, its member societies and the accreditation criteria used to evaluate programs can be found at http://www.abet.org/.